I was like 10 or 11 when I first watched Lord of the Rings. I remember enjoying it and imitating Gollum with my siblings but I haven’t fully understood it. As I grow older, I’ve come across it once again in cable channels. I would watch at first but then I’d thought it was boring so I’d change. I still didn’t understand. And then at 20, I had this craving, this constant thought in my mind that I want to watch Lord of the Rings again. I asked my friends if they had a copy of it. One said he had but his hard drive was not functioning. So that postponed my craving. Months later, the craving grew stronger again. And this time I’m more determined to find a copy. I don’t really know what triggered this craving. And I don’t care what it is. So lucky enough I have a friend that has a blue ray of the three movies. I allotted a day just to watch the three movies. And when I started I finally began to understand what I understood lightly years ago. And it hit me. It’s one of the most well-made movies of all time. I love it so much. And when I watched the thrid movie, as it nears to it’s end, I began to feel this separation anxiety. Like I don’t want it to end. And the End surely hit me through to the bones, my heart and my soul. I was keeping myself together and not cry because my mother, who’s upstairs might come down and see me. (I’m not the usual type that would cry over movies) (Well actually I am. But with the right movie. And when I’m all alone). But the tears couldn’t be contained. So I let some of it stream out my eyes and held a pillow close to my face so I could cover it when someone walks in. 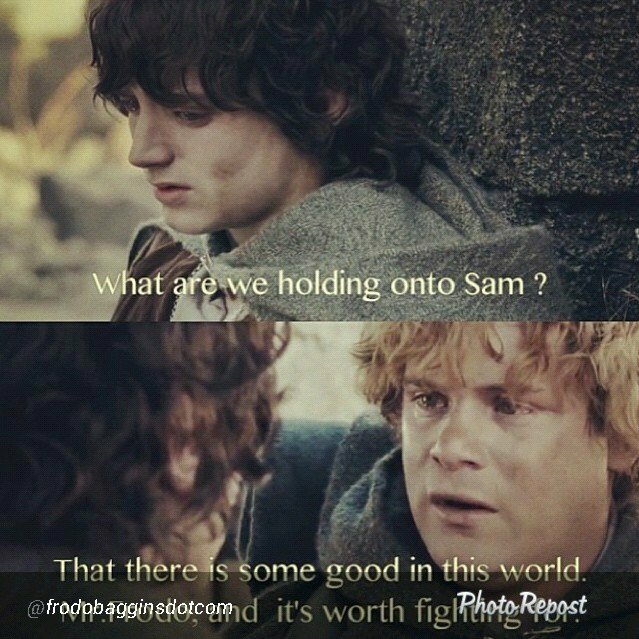 I admired deeply Frodo and Sam’s friendship and I felt a pain in my heart when Frodo left Sam. When the Fellowship’s friendship has ended. When things weren’t the same for them anymore. For me, it was like the end of all endings. I don’t know how to explain it. It was like they continue to live their lives. And I’m not ready to let them go yet. But I couldn’t stop it because it has to end. Frodo had to go. Sam had to live his life with his family and the Middle Earth hails its King and continue on with their lives. It was a rollercoaster of feelings. And I’m glad I watched it again. Because this time, I know. Because this time, I finally understand. This entry was posted in Movies and tagged feels, fellowhsip of the ring, Friendship, frodo, lord of the rings, sam, the return of the king, the two towers by Cat. Bookmark the permalink.